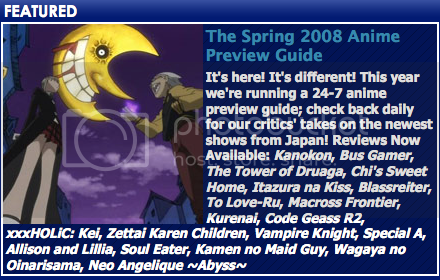 The Anime Almanac » Blog Archive » What’s Happening to the Anime News Network? What’s Happening to the Anime News Network? Now, I have a lot of respect for the Anime News Network. I’ve been visiting their site for as long as I’ve been an anime fan, which has to be a least 7 years now. I read every one of their articles religiously to find out what’s happening in the American anime industry. They have been my inspiration for anime journalism, and the reason why I’m doing this little website of mine as a hobby. One of my proudest moments of blogging was having one of my posts picked up by them a couple of years ago. But I think one of the reasons why I love them is because they aren’t anime bloggers over there. They’re the media, they’re professionals. They are the ones at the anime conventions with the “press” badges while I am the one without one. I have always seen their events correspondent, Mr. Mikhail Koulikov, at every con I go to, and he gives off this vibe of sophistication. He quietly sits near the front, jotting down notes in a tiny notepad, and only raises his hand to ask the panelists the most obscure questions. Compare that to me, loudly typing away at the Mac laptop in front of me, clapping and wooting over any mention of some moé title, and asking the same ol’ questions about digital distribution. There is a difference between the pros of ANN and the amateurs of blogging. It’s that kind of professionalism that gives the ANN its reputation as being one of the biggest, if not the biggest, anime media outlet in America. In my view, anime news simply does not break until it breaks on ANN. The website is a major asset to the entire industry, and that gives them a whole a lot of responsibility and heavy weight to throw around. For the most part, they treat this responsibility quite well. Their news reporting is completely unbiased, and they report the facts accurately backed up with reliable sources. Their editorial content, while still opinionated, has always been very fair and balanced, and always allowed that American industry to showcase their wares. But up until recently, they have held a fairly respectable stance on the subject of fansubs and illegal downloads. They reported on news of take-down notices and consequences, and when pressed on the issue, would honestly talk about how such activities negatively effect the industry they report on. That’s purely out of respect for the niche market that is their livelihood. The website relies on the industry just as much the industry relies on the website. But the moment that ANN comes out and begin to openly support fansubbing, they turn their back on the industry and step into that shady morally gray world that we, the bloggers, live in. As much as we all do it, fansubbing is still illegal. A necessary evil is still evil. It has become a sour note in the industry because it is the reason why most of us aren’t buying DVDs anymore. By presenting these 24-7 reviews of anime episodes fresh off the bittorent, ANN has advocating the practice of illegal downloading. It’s a move that I believe should not have been made, and I’m very disappointed in the ANN because of it. But even beyond the moral issue of turning their back to the industry, the editorial staff has even shown sign of being hypocritical in their policy. They feel that in order to counter balance their new advocating of fansubs, they must also preach violently against it. ANN Executive Editor Zac Bertschy recently did a brutal interview with one of the folks who run the video sharing site Crunchyroll. If you can stomach to read through this gore-fest of journalism, you will find that one of the key points of Bertschy is so adamant in discussing is the fact that Crunchyroll is potentially profiting from fansubs and pirated videos. Bertschy’s point is that this is the reason why the video service is so rotten and evil. And yet the ANN has no problem with fully pimping out their “24/7″ fansub reviews, which they will also eventually profit off of with ad revenue on the site. The comic then turns out to be an editorial piece in which they justify that their fansub watching habits are better and more ethical than this particular “Narutard”‘s fansub watching. Their message is “fansubbing is okay as long as you by a DVD every once in a while.” Coincidently, this is an argument I have also made before. I still very much believe in this ideal, and I’ll fight for it for as long as I can. But there is something very wrong about reading this message on ANN like this. So why is that? What’s the difference between the ANN preaching it and myself? 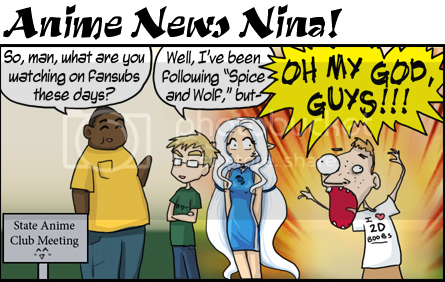 I’m just some ranting a-hole with a blog, and they are the freaking Anime News Network!!! I’m no professional journalist, I’m a software engineer. I don’t have any weight on the industry, and I have not built up years of respectable, unbiased reporting. And as much as I dabble in advertisement, I have yet made a cent off of this blog. I’m just a fan giving my commentary and views, calling it like I see it, and leaving it out in the open for anyone who wants to read it. I’m no where near the level of ANN or other major anime websites. So why is ANN so eager to stoop down to my level? Maybe the line between the pros of ANN and the amateurs of anime blogging is truly starting to blur. This professional media organization is going too keep on going into that morally gray world by advocating the use of illegal fansubs and even posting their reviews of them, and all the while making a living off of ad revenvue. Who knows, maybe they might start serving up links to bittorrent trackers some day. And yet the irony is that I, the amateur a-hole with poor grammar, will finally have that press badge starting this summer at the major east-coast conventions. ANN and I will finally be on that same playing field. While I’m happy that the bloggers are still moving up in the world, I wish it didn’t have to come with the downgrading of a once respectable media. Here’s hoping that the ANN will stick with reporting the news and commentary of the domestic market, and leave the dirty work to the unwashed masses. This entry was posted on Wednesday, April 16th, 2008 at 7:46 pm by Scott	.